Before I tell you how much I enjoyed doing this Google Chromecast Audio review, I should tell you that I've been a big fan of the Google Chromecast products since they first hit shelves years ago. I won't go on and on here, because this is about a new audio component that they recently released. Let's just say that in a house where not everything is wirelessly connected (whether because your stuff is older, or you just change things up too often), it's a blessing to be able to stream content wherever, whenever. The Google Chromecast family has welcomed a new addition, and I couldn't be happier that it's an audio solution! Honestly, we have been streaming audio to our televisions and then using their connected speakers via the Chromecast for video, but who wants to leave their TV on all the time when you only really want to use the speaker? 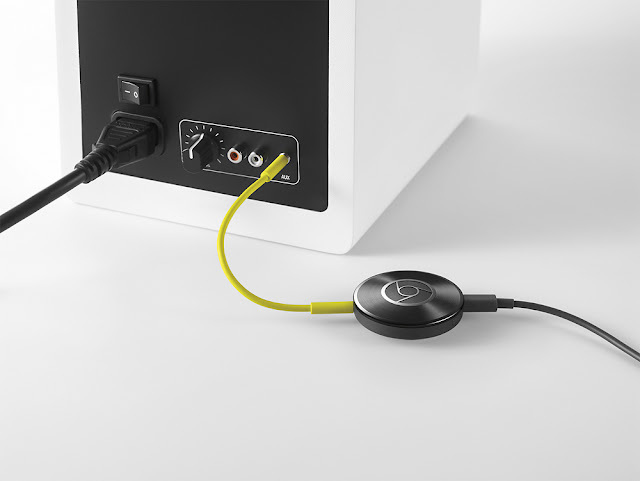 The Google Chromecast Audio product skips the TV, and hooks up directly to your speaker using the audio in line port. It's super easy to set up (taking seconds) and you don't have to have any tech knowledge to get started. 2. Put one end of the green power cord into your Chromecast. Put the other in the "Audio In/ Line In" port/jack on your speaker. 3. Plug the power supply cord into the power jack on the Chromecast and then into the outlet plug. Plug it into your power source, and you're ready to go! The Chromecast app can be downloaded for Android or iOS, so you can stream from your phone, tablet or other mobile device. I'm really a fan of desktops for many things (including my large audio library), so I use the Chrome browser with the option to "Cast" to my device. Just click the three dots in the corner of your browser window, select "Cast", and look for the option to connect to your Chromecast Audio device. During my Google Chromecast Audio review, not only was I able to connect one device to my portable speaker that only worked previously with an iphone or Mp3 player plugged directly in, but I can also stream audio to my husband's treasured radio. He loves the sound from this device, and streaming audio from sports events to it is so easy with this product! Because Chromecast Audio uses WiFi instead of Bluetooth, you can stream crystal clear hi res sound. And, because you control your music from the cloud app on your device or desktop, it’s easy to play, pause, or change the volume from anywhere in the home. Don't forget that you can also play the same music in multiple rooms on different speakers, too. If there was one thing learned from our Google Chromecast Audio review, it was this these are super versatile for dozens of applications in the home and while traveling! Looking to make great use out of your awesome, less techie audio equipment? 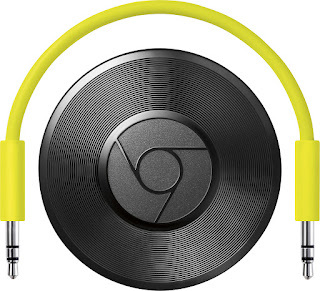 Google Chromecast Audio products at Best Buy now!